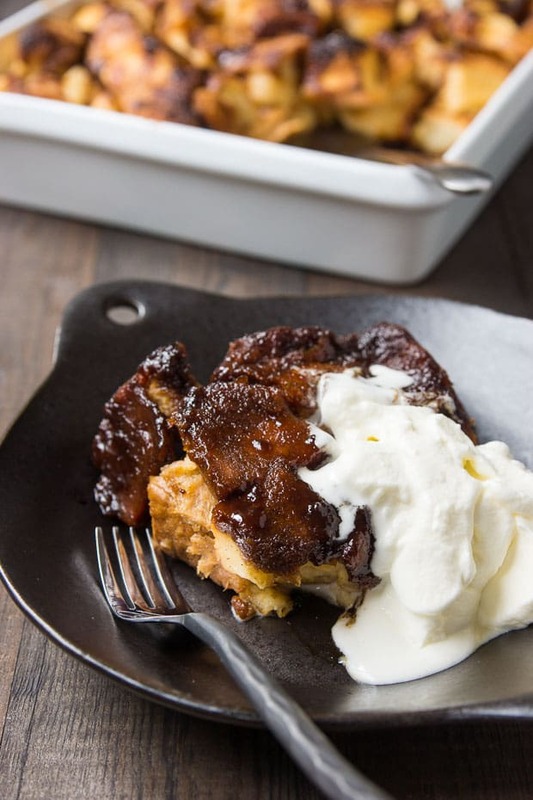 This Sticky Toffee Bread Pudding is a mashup of two British classics with a rich, decadent vanilla bean bread pudding and a sticky toffee date sauce. While the word “pudding” tends to refer to a class of egg and starch thickened desserts in the US, in other English speaking regions of the world it can refer to a range of sweet and savory dishes. Sticky Toffee Pudding is one example of the broader definition and is usually made with a date infused cake topped with a rich toffee sauce. While its history only goes back about 40 years, it’s become a modern classic that can be found in restaurants and homes around the UK, Australia and New Zealand. It’s a supremely comforting dish to eat, but the smell of caramelizing sugar and butter makes it equally comforting to make. I’ve spent this summer travelling around the US, working in kitchens in Colorado and New York. If you follow me on social media you probably know I had a little mishap in Colorado that led to some helicopter rides, a dozen xrays, a CAT scan and a 2 1/2 hour surgery to put the pieces of my right wrist back together. Given the speed at which I was travelling on a 4-wheeler when it rolled, and the fact that I wasn’t wearing a helmet (I know… I’m an idiot), I feel pretty lucky to be alive and relatively unscathed. To make a long story short, I’m finally back home and am definitely in a need of a bit of comfort. 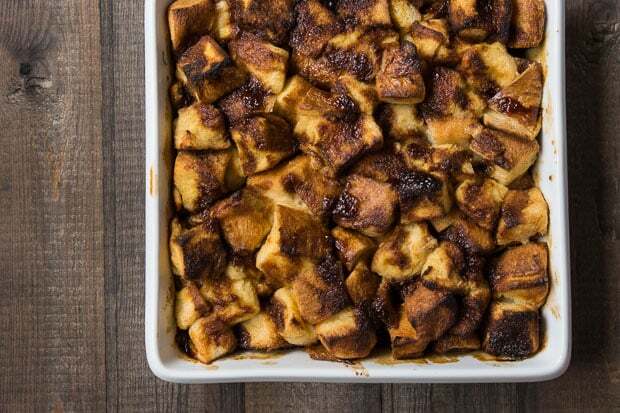 For my first recipe since getting home, I decided to have a little fun and mashup two of my favorite comforting desserts and came up with this sticky toffee bread pudding. 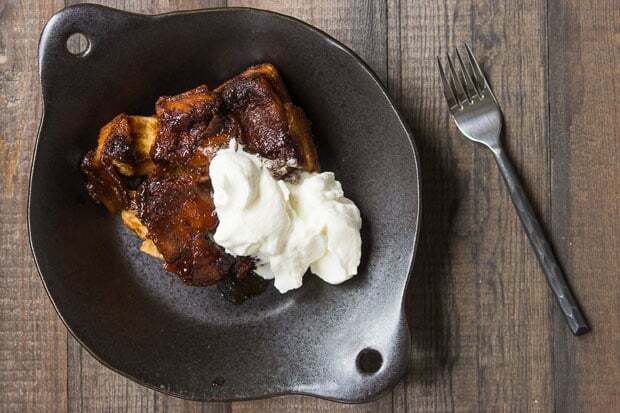 By replacing the cake batter with vanilla bean custard drenched sandwich bread and covering it in a sticky toffee sauce made from date syrup and butter it strikes an awesome balance between a traditional bread pudding and a sticky toffee pudding. To keep the pudding moist on the inside while getting a marvelously crisp topping, I kept it covered with foil through most of its time in the oven. Then, by removing the foil and turning up the heat at the end, you get a rich decadent steamed pudding on the inside with luscious sticky toffee sauce on the bottom and a crisp caramelized top that provides a nice contrast to the dense interior. In a blender add the eggs, milk, cream, brown sugar and vanilla beans and blend until smooth. 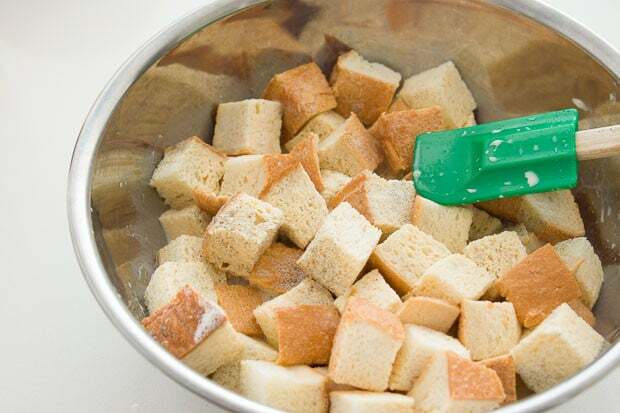 Cut the bread into 1-inch cubes and add to a bowl with the custard. Toss until all the custard has been absorbed into the bread. Let this rest in the refrigerator for about an hour to ensure the custard has fully soaked into the bread. Put the oven rack in the middle position and preheat to 350 degrees F (175 C). 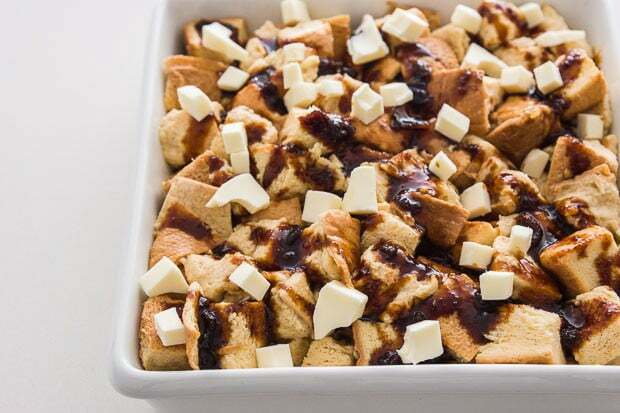 Pour half the date syrup into the bottom of a 9x9-inch casserole dish and then add the soaked bread. Drizzle the remaining date syrup evenly on top of the bread and then distribute the butter evenly on top. Cover with aluminum foil and bake for 30 minutes. Remove the foil and turn up the heat to 425 degrees F (220 C) and continue baking until the top is golden brown and slightly crisp (about another 10 minutes). Glad to hear you’re not too banged up! This looks great. Didn’t realize that Sticky Toffee Pudding was such a recent innovation, it seemed so quintessentially British I assumed it had a longer history.